Oldest Known Winery Found in Armenia 4,100 B.C. That’s Quite A Vintage. 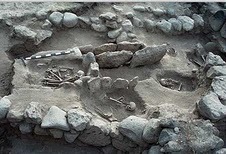 Scientists have discovered the world’s oldest known winery, secreted amid dozens of prehistoric graves in a cavern in Armenia, an international research team said Tuesday. Outside a mountain village still known for its wine-making skill, archaeologists unearthed a large vat set in a platform for treading grapes, along with the well-preserved remains of crushed grapes, seeds and vine leaves, dating to about 6,100 years ago—a thousand years older than other comparable finds. On three pot shards, researchers from the Cotsen Institute of Archaeology at the University of California, Los Angeles, found a residue of malvidin, a pigment that gives grapes and wine a dark red hue. The find, funded by National Geographic and to be reported Tuesday in the Journal of Archaeological Science, is evidence that the quest for a decent red may be as old as civilization itself. The team involved archaeologists from the U.S., Armenia and Ireland’s University College Cork.